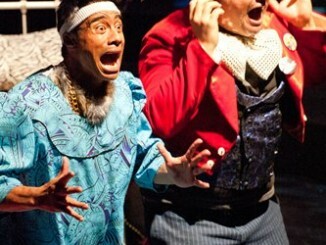 Astroman; by Albert Belz; dir Tainui Tukiwaho, an Auckland Theatre Company Production. Photography Michael Smith. Astroman by Albert Belz cleverly teleports us back to the ‘80s, referencing (to name a few) the Karate Kid, rubik cubes and walkmans. Belz astutely weaves themes around racism, depression, loss and bullying, while keeping the story light and heartwarming. Astroman is fresh, fun, and written for high quality entertainment which offers an unapologetically nostalgic escape from the world we currently live in today. 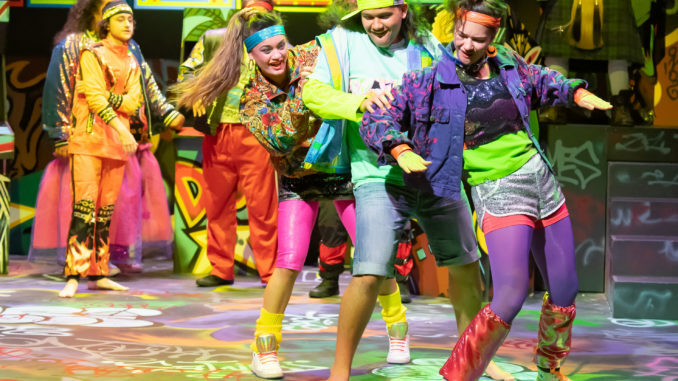 The play opens with a larger-than-life dance number (choreographed by Justin Haiu) which features original ‘80s gaming characters like Donkey Kong, Super Mario and Pacman and sets the mood for the show ahead. The set is beautifully designed by John Verryt, adding to the facade of the ‘80s gaming parlour world. The lighting design by Jane Hakaraia is stunning and next-level. My experience on opening night transported me into an actual arcade game, heightened by the sound design (by Laughton Kora) and motion graphics design (by Harley Campbell). The story revolves around Whakatane’s local gaming parlour, the Astrocade owned by the Scottish widower, Mr Macrae (Gavin Rutherford) and his unlikely friendship with our protagonist, Jimmy (Levi Kereama), a 14 year-old Māori boy. Other members of the cast include Sonny, Jimmy’s fraternal twin brother (Kauri Williams), antagonist gang leader Mick Jones (Aaron McGregor), Jimmy’s mother Michelle (Miriama McDowell), teacher Mrs Mahara (Nicola Kawana) and Jimmy’s older sister Natalie (Rickylee Russell-Waipuka). Chorus members include Dallas (Tyler Wilson Kokiri) who is Mick’s only other gang member, Dynasty (Tatum Warren-Ngata) who is Natalie’s friend and Takanini Fulla-Girl (Brady Peeti) who is the Auckland representative for the world gaming championship held in Whakatane later in the show. Jimmy draws us in during his opening monologue, introducing us to his world. It’s Jimmy and his fraternal twin brother, rugby/food-lover, Sonny’s 14th birthdays. It’s 1984, we’re in Whakatane, and their Dad apparently sent them a BMX as a present. Jimmy is immediately charismatic, charming and super-smart (and knows absolutely everything about Computer Science). He doesn’t take school seriously and is often misunderstood for lashing out through his various misdemeanor-like activities. A few of his highlight moments come from the cliche teenage-response where not many words are said, but are all told by in his facial expressions, Kereama embodying the idiosyncratic details of an ‘80s teenager. The play is beautifully written with various sub-plots which allows each of the cast to have stand-out moments. McDowell’s portrayal of Jimmy’s Mum is honest, real and relatable as she only wants what’s best for her family (in the hopes of reuniting them with her husband). She embodies a powerful wāhine but shows vulnerability, highlighting many emotional facets. Kawana’s portrayal of Jimmy’s teacher, Mrs Mahara, is equally amazing. In her story, she has a few troubled issues with Jimmy’s character in her classes but they’re overshadowed by how super-smart he is, so she decides to submit him (without Mum’s knowledge) on a scholarship opportunity in Auckland to fulfil his potential. Kawana’s performance highlight is shown through the comedy of her love interest in Mr Macrae. But, judging by the reaction at the opening, none of the highlights come close to chorus member, Brady Peeti (Takanini Fulla-Girl). Before seeing Peeti’s character on stage, we are introduced to her character name, and as the representative of Auckland for the world gaming championship, gets the most cheers from the crowd. Finally, upon arrival only for the competition, the character steals the scene with her high-kick entrance and then blows us away with her rendition of Eye of the Tiger. 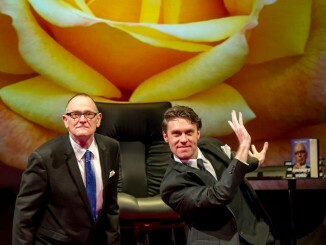 There are a few jokes in the play that suggest transphobic and homophobic connotations. As a Pasifika queer-cis-man, I ask myself, do I find this offensive? Yes. But, can I understand the intention of this? Sure. For a play to embody the specificity of remote communities in the ‘80s from Aotearoa, Belz has made a bold choice to incorporate this in Astroman where the life of a trans/gay/queer person isn’t immediately welcomed in that era (although in this show, Takanini Fulla-Girl’s character is). The daring jokes about monkeys, South Africa and aids could have been reworked to avoid empowering ignorance, but what does it say about the audience that they managed to get the most laughs on opening night? While focusing specifically on a small town (predominantly Māori) community, Astroman speaks to Aotearoa as a whole. As a Pasifika person of the 21st century, I truly admire the representation of a brown protagonist that isn’t stereotypically cliche. Jimmy’s character (like many Pasifika/Maori people I know) is super smart, capable and a little rebellious. Albert Belz describes this play as a love letter to the ‘80s. I say, it’s a letter from the ‘80’s and speaks to the seriousness of the world today: to sometimes remember to loosen up, take a breather and rebel every now and again. Astroman is presented by Auckland Theatre Company and Te Rēhia Theatre Company and plays at Q until 6 April as part of the Auckland Arts Festival.